Annuity rates have remained steady even though 15-year gilt yields fall 13 basis points as investors leave equities fearing a US slowdown in 2019. Global equity markets reduced by about $5 trillion in value with continued geopolitical tension between the US and China with investors seeking the safety of bonds and gilts. Wall Street is concerned of an economic slowdown in the US in the next year with evidence of high volatility in markets, tech giants such as Apple with a drop in orders and weak growth in China suggest a possible recession in 2019-20. Uncertainty over the Brexit vote has added to lower gilt yields which have reduced to 1.50% although providers have resisted reducing annuity rates in the short term as the following table illustrates. The FTSE-100 index reached a recent low on 27 December of 6,584 following volatility on the global equity markets. 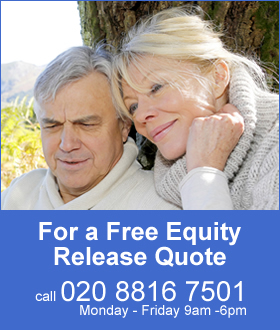 Since then markets have rallied up 5.0% to 6,918 benefiting people retiring now to take their benefits as an annuity. Action taken by President Donald Trump's partial shutdown of the government until unless his demand for $5 billion of funding from Congress has added to the uncertainty in the short-term but not affected financial markets so far. 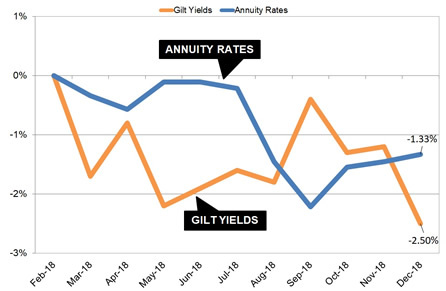 Over the year 15-year gilt yields have reduced by 25 basis points and as a general rule this would mean annuity rates would reduce by 2.5% over time. Providers have resisted this trend and rates are lower by -1.33% suggesting annuities will fall at some point if yields do not recover. For the month of December standard pension annuities are higher by by 0.10% during the month and smoker & enhanced rates are higher by by slightly more at 0.18%. 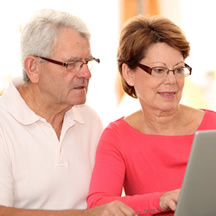 There is greater risk for those that remain invested until they buy their annuity. The main risk is geopolitical uncertainly and the impact on the value of their pension funds. For equities the FTSE-100 index reached a recent high last year on 8 August at 7,776 reducing 15.3% to 6,584 at the end of the year and remains below the 7,000 level. Volatility is likely to continue in 2019 including interest rate rise in the US which increases the cost of business investment and could undermined investor confidence in markets. The Federal Reserve increased interest rates by a quarter of a percentage point to a range of 2.25% to 2.5% which is the ninth rise since 2015 based on the current strong US economy. On Wall Street the gap between the two-year and 10-year Bond yields is very close. This occurs when short-term rates are higher than long-term rates resulting in an inversion. This has occurred before every US recession over the past 50 years.